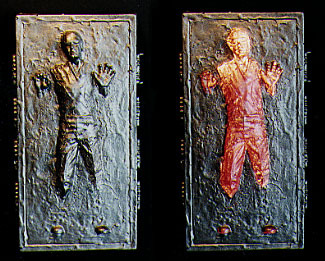 I made a cast of Han's "Carbonite Freezing Chamber" in clear red resin. Then I painted everything but Han's protruding body parts flat black, leaving a small section on the back of the block unpainted. After making sure that no light shone through the flat black mask, I painted the front and sides silver-grey, painting a very thin coat over Han's body. Now the block looks normal until paced in front of a light, then Han's body glows bright red. I wanted to take this further by embedding miniature lights or LED's in the cast, but it doesn't look like that will ever happen.